Have a fabulous Easter with Mike, Emma and their classmates painting and hunting for Easter eggs and Chocolate Bunnies. Help build and ride on Easter floats in a Parade through Town with everyone from Clowns to Cheerleaders, Astronauts to Marching bands, the Easter Bunny to the Carnival Queen. Go home and help Mom get ready for Easter, before visiting the Funfair on the way to the best and biggest Easter Egg hunt ever. 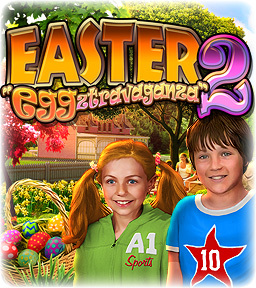 Easter Eggztravaganza is crammed with neat puzzles, gorgeous Hog screens and mini games that will make the whole family want to play it time and time again!